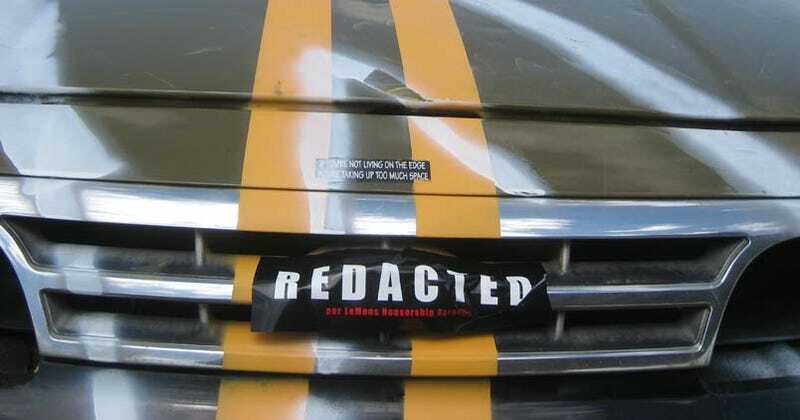 Remember the the 24 Hours Of LeMons Nonsorship Package, in which Detroit automakers were offered the opportunity to have their corporate names redacted from LeMons cars? When we saw a F—-, L—-—-, or M—-—- roll up into the BS Inspection area, we'd cover the corporate emblems with special "REDACTED" stickers. That way, the F—- M—— C—-—- doesn't have its image damaged by the hoopty machinery on the track! And, yes, that's an IRS-equipped L—-—- M—- V—- you're seeing. Things are about to get pretty crazy here and I can't promise many live updates for a while, so check out this site for some live race coverage!